Ranking the works of Thomas Newman might seem an easy task given the composer’s wealth of career-projects; however, it’s almost as frustratingly difficult as being nominated for an Oscar but never bringing home the golden bacon. Nevertheless, I take on this formidable task with giddy eagerness because it affords me the chance to dive back through some of most emotionally stirring movie music to come out of Hollywood over the last 20 years. The one easy part for me (which may make some of Newman’s fans immediately upset) is eliminating from contention almost every one of his works that can be grouped into the category I call the “American Beauty Group.” There were a plethora of scores that Newman produced, principally in the 90s, which were of this quirky, minimalist variety best exemplified by his highly recognized score for AMERICAN BEAUTY. Others that fall into this group, and hence immediately out of contention from this top ten list would be among others: WHITE OLEANDER, PAY IT FORWARD, ERIN BROKOVICH, IN THE BEDROOM, and SALTON SEA. That said, and somewhat ironically in light of the popularity of some of the aforementioned titles, few composers can do “majestic” like Thomas Newman. While some of his scores can almost be indistinguishable from one another, often times, there are incomparable moments of wonder, exultation, and brilliance dotted throughout these very same scores. One may find that scores like this, which tend to trend earlier than later in his prolific career, dominating my top ten list. One of 2008’s most powerful and best acted films was directed by Sam Mendes, which pretty much ensured that Thomas Newman would be on the case as well. Again, Newman provides a dream-like, sonic landscape with piano, woodwinds and strings, supporting the apparently young and loving, suburbanite-couple perfectly. However, Newman’s introduction of jazz improvisations and progressions tells us that this story will go in unanticipated directions and that this relationship is far from harmonious. The end result is a score that, if experienced within the gut-wrenching film, can hardly be forgotten. One of Pixar’s top efforts, WALL-E, featured very little dialogue, putting a greater amount of weight on its original score to help tell the story. Newman is clearly up to the challenge effetively adding even more layers and textures to his strongly ambient style. He crafts a memorable robot-love theme and treats us to a number of playful and innocent themes which are well contrasted by a handful of thrilling action sequences. Looking for something majestic? If so, then The Horse Whisperer is for you. The title theme is oft used throughout the movie, sometimes reaching emotional peaks that Thomas Newman has become adept at scaling...when he is allowed to. The reason this title isn’t higher is simply due to the abundance of blue-grass-flavored tracks that break the rapture these other tracks have produced. That, and because the tracks containing his summit reaching music are so very brief. Anyone who has seen this film or listened to the soundtrack has certainly not forgotten the film’s climax or Newman’s underscore. Wait. Saying “underscore” is a poor choise of words as there is nothing “under” about this piece. “That Next Place” (which is over 10 minutes in length) is one of the most emotionally, over-the-top-cues you will ever hear...and that’s why so many love it so! While that and the track “Walkaway,” with its gentle introduction to the score’s main theme, get the majority of attention on this soundtrack, there is quite a bit more to appreciate. It’s not groundbreaking in anyway, but Meet Joe Black is a great representation of Thomas Newman’s talents. Here’s one that suffers from it’s own success. Some of the grander moments of his music for Shawshank, like the majestic “End Title” have gone on to the realm of trailer-abuse. We have heard it so many times, attached to so many things, that it may have lost some of its potency or even become a bit of a parody. Regardless of the later abuse, pieces like “So Was Red” remain among Newman’s best. Now, outside of those well-worn, but still satisfying pieces, Newman’s bass-lead Stoic theme, plods along in its own monotonous desperation until his ever-hopeful strings join in the undulating rhythm. Newman’s score should be seen as every bit the classic that the film itself has become. If anyone could make an Irish-mafia film contemplative and melancholy, Thomas Newman could...and did for Road to Perdition. This was certainly one of Newman’s stand-out efforts of the early 2000s, as his languishing strings are this time punctuated by by lively bagpipes and tin whistles. The somewhat controversial HBO series won Golden Globe and Emmy for Best Mini-Series and was the most watched series made for cable movie in 2003. While Newman didn’t receive any major nominations for his work, his music, no doubt makes a significant impact on the audience. Newman underscores the pain filled stories of the series’ central characters utilizing his familiar palette of instruments and techniques, but he also, on occasion, gives us doses of frightful dissonance attached to glorious choral eruptions. Infused with Newman’s familiar ethereal qualities, ANGELS makes for a more intriguing and unpredictable listen than many of his other works from the early 2000s. Newman’s title theme for this film alone carries it to this lofty position in my top 10. While the ingredients of the piece are common to much of his work in the mid-1990s: soft strings and lead oboe, Newman’s languishing theme hits home. The same can be said for his track “The Diver” which bears close resemblance to memorable pieces from The Horse Whisperer, but QUILT precedes that film by several years. Unfortunately, the soundtrack release saw Newman’s efforts painfully interrupted by the likes of Bing Crosby, Neil Diamond, and Benny Goodman. This score has always deserved a more complete release. Newman provides a surprisingly contemporary take on the story of a priest and an heiress who look to build a glass church...in the outback of Australia no less. The story affords Newman a natural opportunity to employ the use of glass and chimes to great affect. The other striking inclusion is that of the full choir in the title theme; showing up at the most elevated moments of the film. Looking at Thomas Newman’s extensive list of scores, the use of full choir is rather rare, especially in this very traditional manner. The mid to late 1990s found Thomas Newman at the top of his game and his score for LITTLE WOMEN is the tops of the top. Not only offering a Christmasy-good-title-theme, “Orchard House,” but the interior tracks also contain a special brand of magic and emotion found in varying quantities in his other works of this era. His liberal and bright use of brass, bells and other chromatic percussion on top of his familiar string lushness truly distinguishes this effort and places it firmly in the top position. So there you have it! Did I miss one of your favorite Thomas Newman scores? 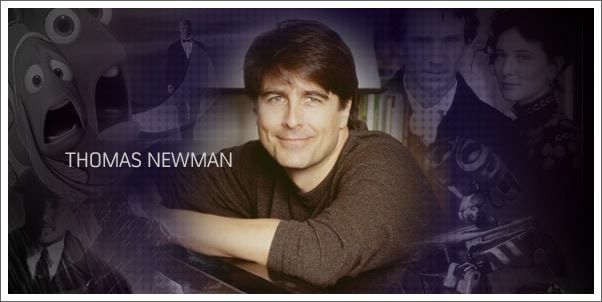 Let us know what your favorite Thomas Newman scores are in our comments section.